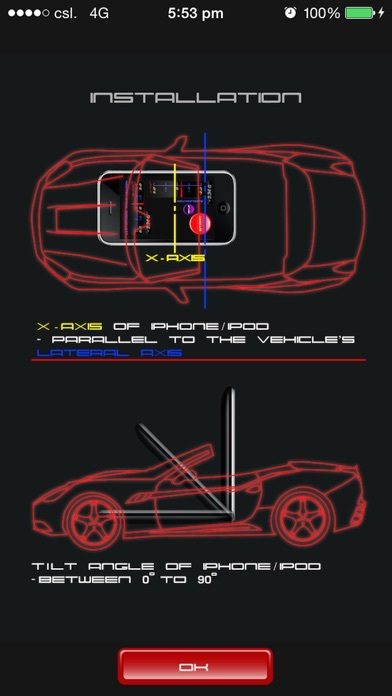 G FORCE makes your iPhone or iPod Touch a handy vehicle G-Force meter. A nice looking enhancement to the dash of your car, too. Quantify the G-Force you experience in the vehicle (e.g. during acceleration, braking, drifting, cornering etc) or perform a quick dyno. Its unique "Sound Alert feature" provides alert sound when the g-value exceeded a user selected limit. (1) "Quick & Simple Calibration"
Simply press the start button and G FORCE takes only about 0.5 seconds to calibrate to your iPhone's tilt angle. Two "Linear Gauges" and two "Digital Displays" show the real time lateral (e.g. cornering) and longitudinal (acceleration, braking) G values. 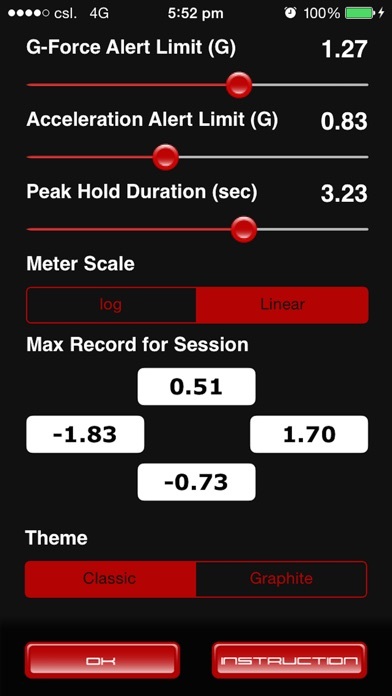 Adjustable "Peak Hold Duration" helps you monitor peak values. (4) "Graphical Peak Hold Indicators"
Distinctive graphical peak hold indicator makes observing peak values a quick glance. Provides alert sound when the G-Forces exceeded a user preset "threshold". "log Scale" and "Linear Scale" helps you utilize the "Linear Gauges" for different conditions. e.g. Use log Scale in "mild" acceleration conditions or use "Linear Scale" in "aggressive" acceleration conditions. Shows all the maximum G values in the current session. Facilitates quick and easy operation. Switch between the Classic and Graphite Theme to suit your taste. With its nice interface and unique features, you would like G FORCE even though you may have already got other g-meters like dynolicious or even a hardware equipment.